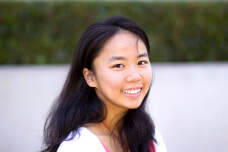 Bianca Cung is a Ph.D. student specializing in Language, Literacy, and Technology (LLT). She received her undergraduate degree at UCLA. She also concurrently received a master's degree from UCLA in Statistics. As a graduate student, Bianca has been investigating digital learning, particularly at the university level and in open education. She uses data mining techniques to examine trends in click data from online courses. Her current research focuses on student study habits and student use of time in online courses. She has conducted nudging experiments in online courses and examined differences in study habits and outcomes. Bianca plans to further investigate the effects of various light-touch interventions on study habits and course outcomes in digital spaces. Bianca's research interests include media and technology for education, data mining, STEM education, heritage and second language learning, adaptive tutorial instruction, cramming and procrastination, and study habits.